Ok, so it’s called Arizona chicken, but still…I was in bed using my handy dandy recipe app for my IPad and snagging recipes offline. I got this one from the Taste Of Home site. It was a bit of a pain,considering I had to do it in two batches since I only have one cast iron skillet and I refuse to cook in anything else. We eat a lot of chicken in this house because I absolutely LOVE the chicken from our local co op. The chickens are raised scratching for bugs and whatnot, and only fed non-gmo corn on the off season. Well worth the price, and it’s SO tasty. 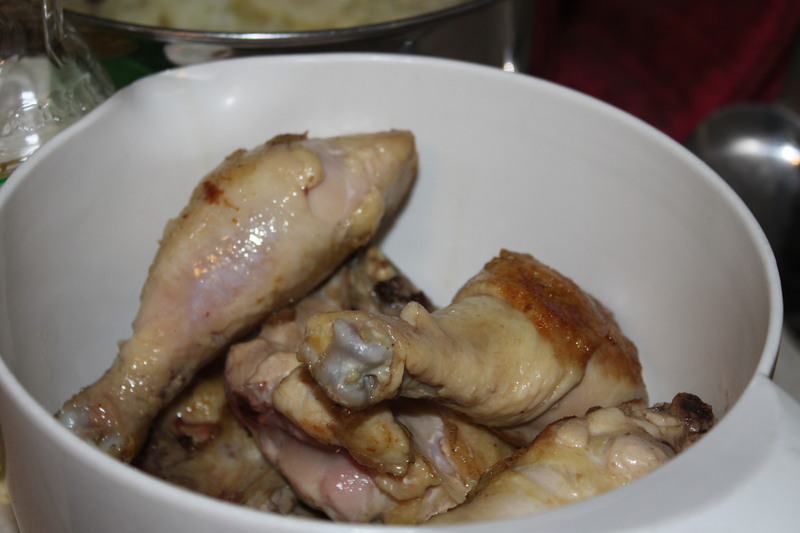 So, first for this recipe you are gonna need chicken. Officially the recipe calls for chicken breast but all I had was quarters and quite frankly I don’t buy into the fat is bad paranoia. I actually prefer dark meat and so does my blood sugar. I cut those up into pieces. 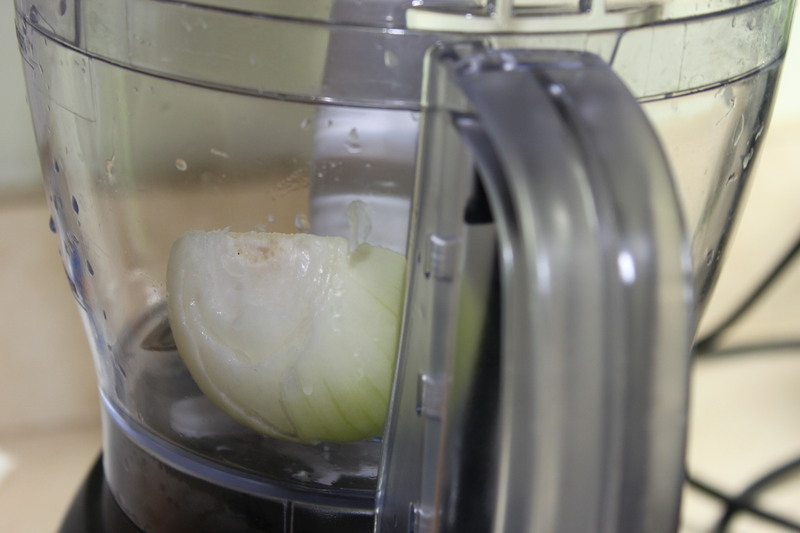 Then I busted our my food processor to chop my onion. Really, if you don’t have one of these yet. Get one. They are cheap and they save a TON of time! My bird absolutely HATES the sound of the food processor, or loves it, I can’t tell. He’s always trying to imitate it. Hit that pulse button and show that onion who’s boss. Now you are gonna have to chop some tomatoes. 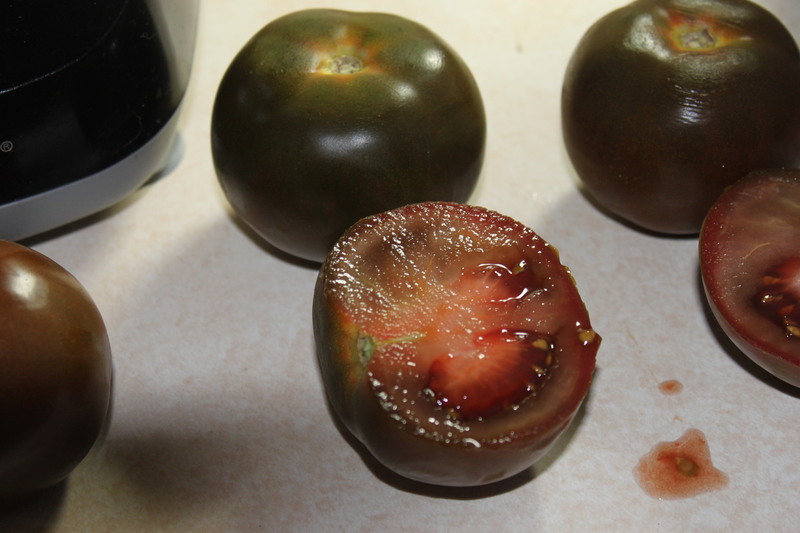 I got these German breed tomatoes, I used to actually grow them in the garden. They are a bit peppery and you can eat them like you eat an apple. Do the same thing to the celery. 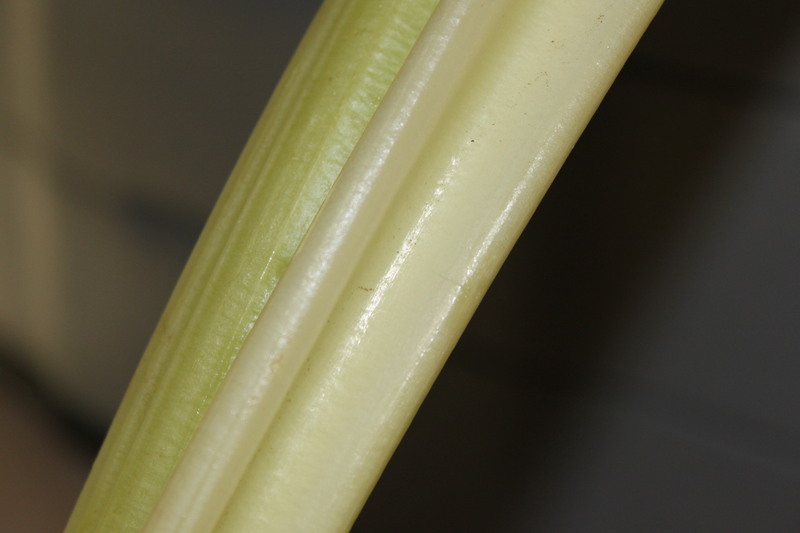 Poor stalk. 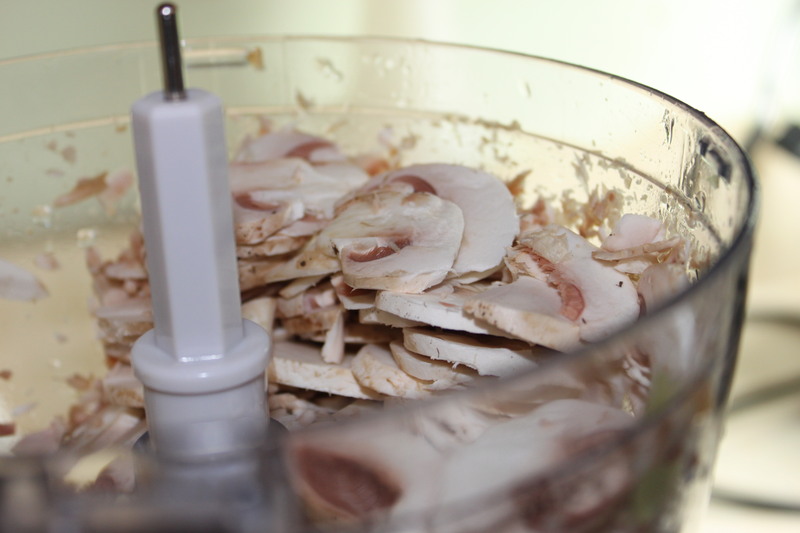 Now slice up some mushrooms. 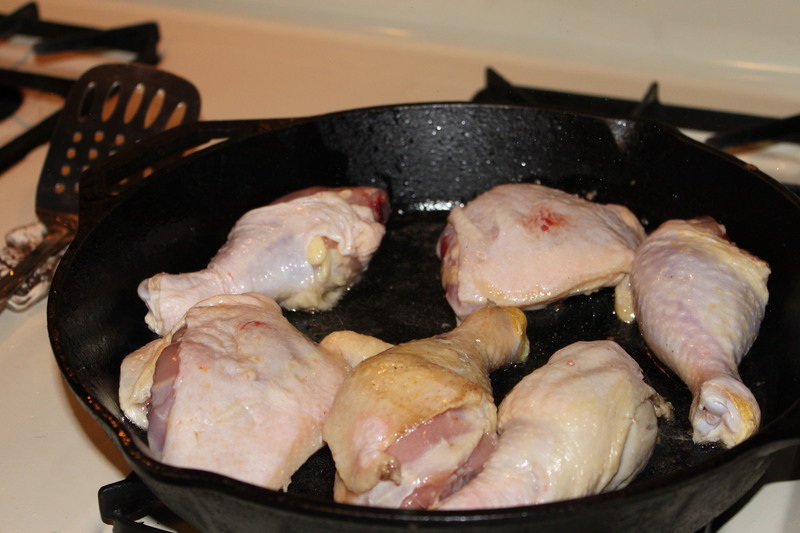 Now that that’s all done you are gonna heat some oil in a skillet to brown the chicken. 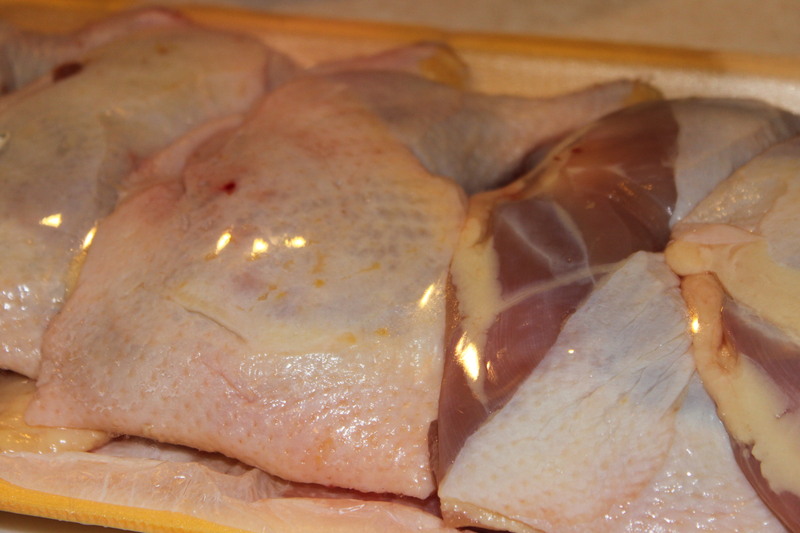 I browned mine, then cooked them a little longer because they are pieces, not breasts, which take longer to cook. 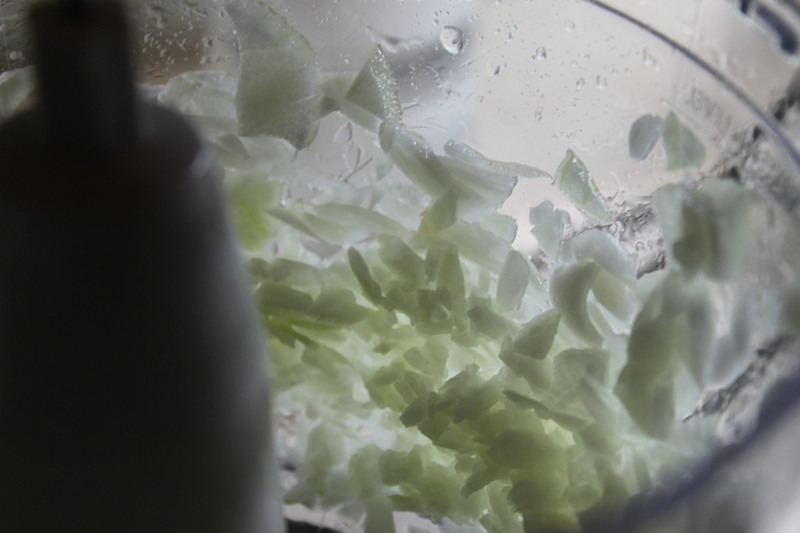 Handy to have some aloe in the kitchen, like I do, because this stuff will pop from beginning to end. Ow. And it popped right onto my face, of course. Damnit. Now, remove them from the skillet and set them aside. This recipe calls for olives. I instead used something called Muffelatta. 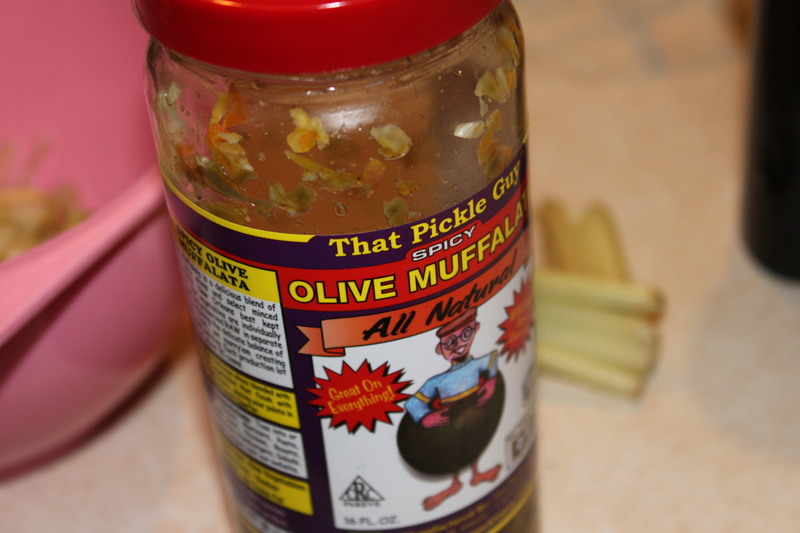 Most people know muffaletta as a type of sandwich in New Orleans, or more specifically, as the famous olive relish ON the sandwich in New Orleans. I’m addicted to this stuff. Being so far north, good luck finding it. However, I found an appropriate substitute until I can make my way back to my dear Nawlins. It’s made by That Pickle Guy. He’s got a website where you can order the stuff and I’ll let you know now, it’s freakin’ HABIT FORMING. On crackers, hard boiled eggs, salads, OMG. It’s diabetic friendly too and very natural so I go through jars and jars of this, thank god my local costco now carries it. 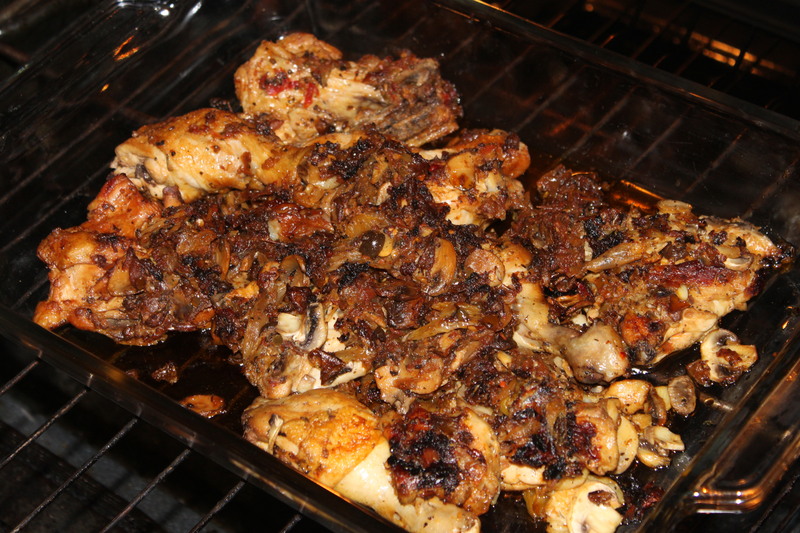 I had some of their spicy version in my fridge I decided to use for this recipe. Even if you DON’T like olives, I’m certain you will love this stuff. It’s heavy on the olives but does NOT taste olive-y, I don’t know how he does it, but he does it, and it’s damn good. Now you are gonna put the tomatoes, celery, onion, oregano, garlic, olives, salt and pepper into the same pan and saute them. 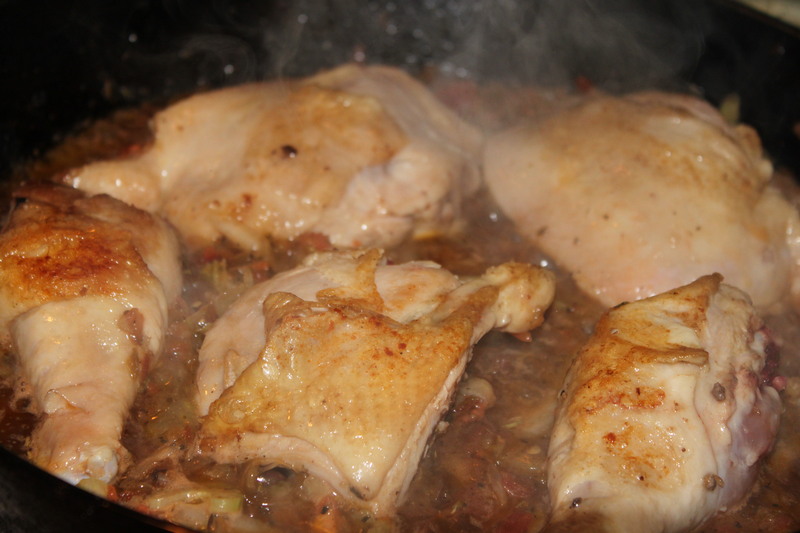 Once you’ve brought that to a boil and simmered 15 minutes, add the chicken back in and simmer that 15 minutes. 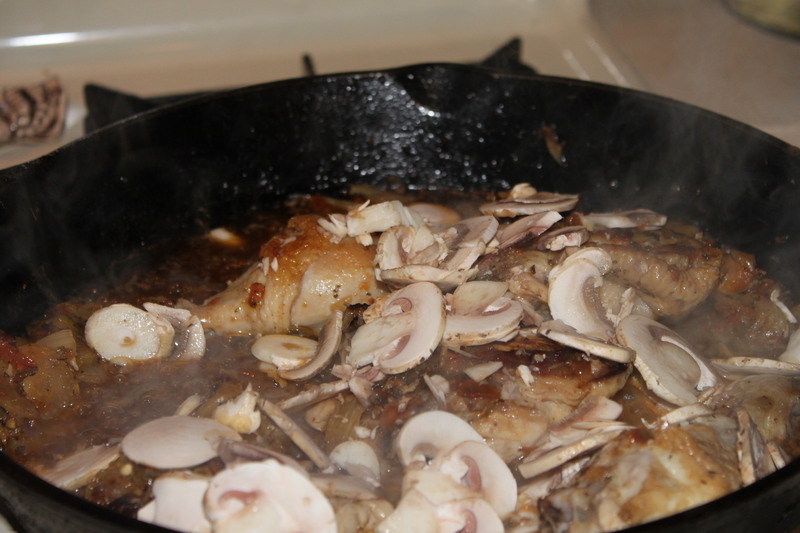 Now add you mushrooms and cover, and keep simmering. I don’t have a lid for my skillet, so I just use a cookie sheet. I had to do mine in batches, so I kept the batch in the oven to warm. And it looked so damn good. And it WAS so damn good. It had a nice amount of spice and brown to it, but I don’t know if that’s from the spicy olive relish or what, but this is certainly a keeper. It’s something different to do when some chicken is on sale, a break from the same old fried, or coated, or steamed, or bbq chicken. 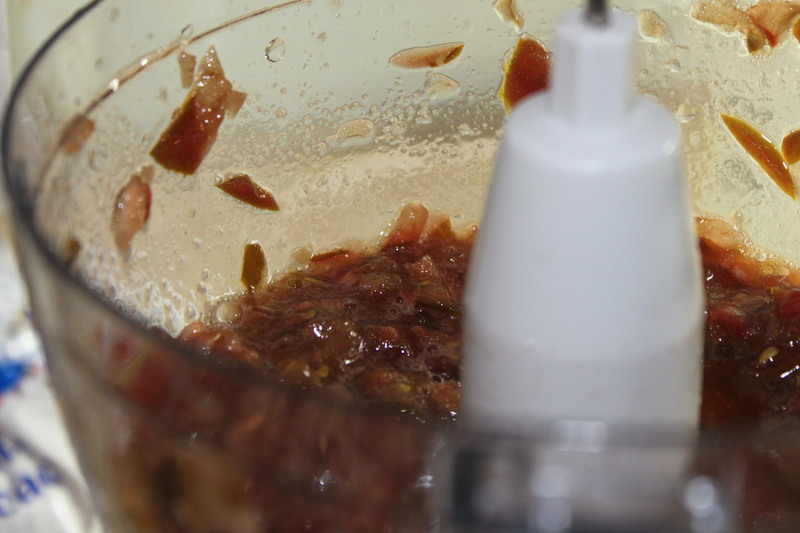 But I still suspect the olive relish was the culprit. Viva New Orleans! Oooo – sounds Yummy! I am not crazy about olives although I live in the middle of an olive orchard! LOVE Olive Tapenade though – is that similar to Muffala? This is going in one of my famed bookmark folder! Thanks! I hope you love it! If you get a chance visit I think it’s thatpickleguy.com It’s not like olive tapenade, not really, no. There’s actually no way to describe it if you’ve not had it, but it’s not super “olivey” even though it’s mostly olives. LOL I know that makes no sense. I’m NOT a fan of most olive type stuff, but this is totally addictive. 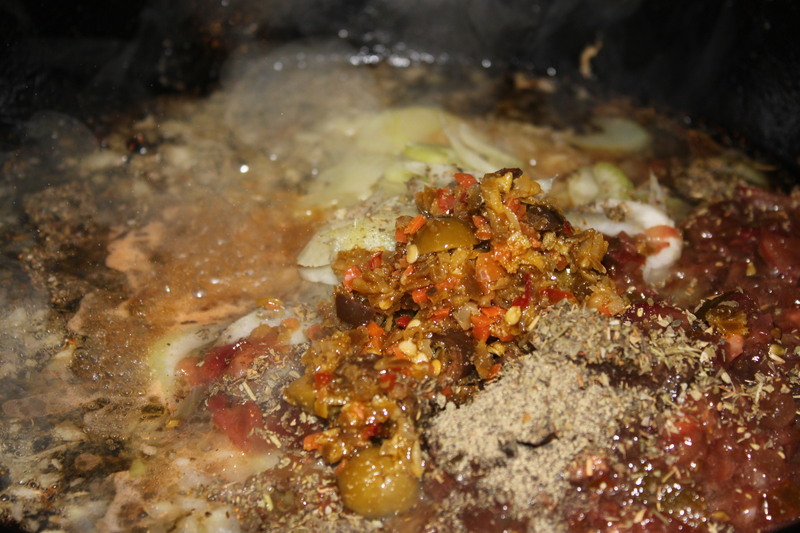 The way it’s spiced is totally different because it relys mostly on the other veggies in it to create the spice. It’s just amazing. Another mouth-watering recipe! You are the best — I’m printing all of your recipes and keeping them in a file in my kitchen. Thanks! Awesome! I hope you have as much fun with them as I do!